NCDOT officials told local business and government leaders in Cornelius this Wednesday they are still studying potential changes to the $670 million I-77 toll lanes project from Charlotte to Mooresville. Some of those leaders said afterward they aren't hearing anything new. The meeting of the DOT's I-77 Local Advisory Committee was supposed to be an update on progress toward changes in the unpopular project. But DOT officials say they have yet to begin negotiating anything with toll-lane builder and operator I-77 Mobility Partners. A newly constructed ramp from I-277 westbound to I-77 southbound near uptown opened Monday afternoon. The old ramp closed last September and since then drivers have had to detour by going north on the Brookshire Freeway. The contractor behind the I-77 toll lanes has pushed back the date for a portion of the project's opening. I-77 Mobility Partners said the northern section of the toll lanes, near Hambright Road to Exit 36 in Mooresville, had been set to open by the end of 2018, but delays from weather and a more expansive project forced the company to adjust its open date. That section of toll lanes is now expected to open in the first quarter of 2019. In NC Senate Race, Tarte and Marcus Blast Toll Lanes. But Could They Have Done More? In the race for state Senate District 41, Republican incumbent Jeff Tarte and Democrat Natasha Marcus are trying to out-do each other’s opposition to the Interstate 77 toll lanes. A rush hour commute on all 26 miles of the toll lanes on I-77 from Charlotte to Mooresville will cost up to $6.55 one way when the lanes open later this year - and more later on. The project's contractor announced the rates at a public hearing in Huntersville last night, and hinted that some sections of the project may not open on schedule. The contractor building toll lanes on Interstate 77 north of Charlotte will unveil initial toll rates and hear public comments at a meeting Thursday night in Huntersville. One of the big questions about the North Carolina Department of Transportation's I-77 toll lane project north of Charlotte is how much will the tolls cost? Expect an answer in two weeks at a public hearing on the rates. 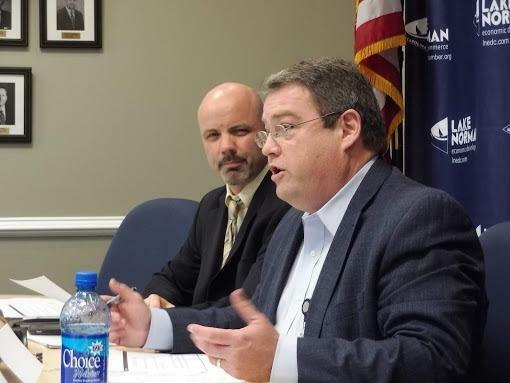 State Transportation Secretary Jim Trogdon told Lake Norman area leaders Wednesday that the Department of Transportation cannot buy out its contract with a private company building toll lanes on I-77 north of Charlotte. State Transportation Secretary James Trogdon will be in Cornelius Wednesday afternoon to brief the NCDOT's Local Advisory Group on options for modifying the controversial I-77 toll lanes project. The visit comes three months after most local officials in the group backed their own proposal: Buy out the $650 million contract with the private company building the lanes and convert one toll lane to a free lane. Construction crews still have lots of work to do before toll lanes can open on I-77 from Charlotte to Mooresville. The question on commuters' minds is: Will they be ready as promised by the end of the year? The North Carolina Department of Transportation will hold public meetings this week on several projects to improve travel times on roads in south Charlotte – including toll lanes on I-485. State legislation to fund a possible buyout or changes to the North Carolina Department of Transportation's I-77 toll lane project near Charlotte has died. That's according to state Sen. Jeff Tarte (R-Cornelius), who wrote a key amendment to provide the funding. A state auditor's report out Tuesday has found nothing improper about the North Carolina Department of Transportation's nearly $650 million contract with a private company to build toll lanes on I-77, or in the way the contract was awarded. Two state transportation policy changes — affecting light rail projects and the I-77 toll lanes — could become law as part of the state budget that passed the legislature Friday. An advisory group that's helping the North Carolina Department of Transportation review the $650 million toll-lane project on I-77 will meet again Thursday afternoon to offer final recommendations. Some members want to cancel the deal, but it could come at a steep price. A draft report is out from a consultant reviewing the contract for the I-77 toll lane project north of Charlotte. Mercator Advisors says it would have cost NCDOT at least $149 million to cancel the contract with the private company hired to build and manage the lanes - using figures as of Dec. 31, 2016. The number of homicides in Charlotte this year is now up to 40. That’s after police announced charges against two people in separate cases over the past 24 hours. A truck driver who struck an overhead sign while working on the I-77 widening project in Mooresville last week is facing charges after police found he did not have a valid license. The accident led to a day-long backup on the interstate and side roads in the Lake Norman area.